Tune into the My Beauty Binge podcast this week to hear tips and ideas on how to care for your skin during the harsh winter months. Also, learn a few makeup tricks from NY-based makeup artist extraordinaire Maria Luxen, founder of Makeup Mayhem, on how she ensures her makeup always looks flawless despite the wind and snow. 1. Kate Somerville ‘Dermal Quench Liquid Lift’ Advanced Wrinkle Treatment ($95): I’m a huge fan of in-spa oxygen facials and this treatment seems to mimic the instant smoothing effects of an oxygen facial and still manages to reduce redness and fine lines over-time. I had two consistent dry patches on my cheeks that were softer after Day 1. It’s also perfect for pre-event regimens since it has temporary wrinkle-relaxing PFC- carriers to relax facial muscles. Read my original review here. 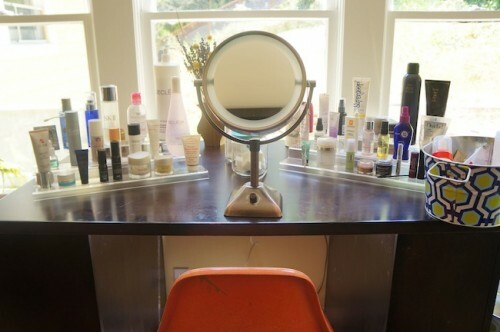 Then once I get to my little skincare station (see above photo), I could spend a good 15 minutes doing a a basic routine or 30 minutes to go the extra mile and give myself a mini-facial. If I’m testing products, forget about it. I could be there all morning! 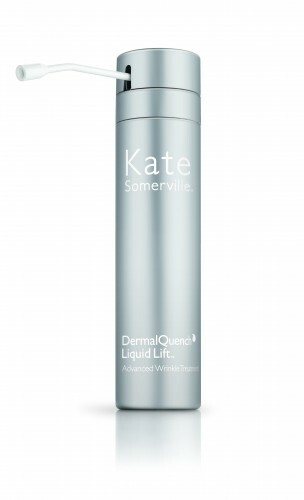 Today’s Sunday Splurge, Kate Somerville ‘DermalQuench Liquid Lift’, retails for $95. I know $95 is pretty on par with quality serums, but I decided to make the DermaQuench Liquid Lift a Sunday Splurge because I went through the bottle so quickly! At this rate I will have to get a new bottle once every 1-2 months, though it’s a small price to pay for the results. For those of you unfamiliar with Kate Somerville, she’s esthetician to the stars (the likes of Jessica Alba and Demi Moore) and has a gorgeous, multilevel spa in LA. Her spa is famous for their Dermal Quench Oxygen Treatment, an intense hydrating facial using pressurized oxygen to deliver the potent ingredients. Somerville found a way to convert her famous facial into an at-home treatment with the DermaQuench Liquid Lift.